Dragon Lady is unique, to say the least. We got her when she was a 5 year old and had never been shown in milk nor I believe ever kept in milk. She's very dairy with a long neck and has flatness of ribs with nice spacing. She has a nice udder with ample attachment with nice plump teats. 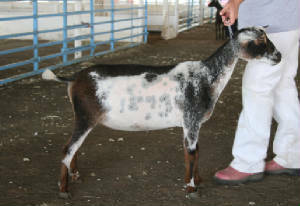 She will earn her full milking star in both ADGA and AGS as a 7 year old this year. 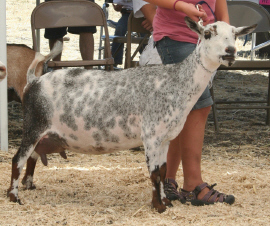 Erica showed her quite a bit this year and she finished in ADGA and is one championship away from finishing in AGS. She isn't fond of kids or people in general but continues to throw some great kids who are very friendly. We have retained a doe and a buck from her in the last 2 years. With 6 freshenings she has thrown over a dozen kids, we call her "The Old Hag" but all kidding a side she's a great doe and has held up pretty good.